Show off your belly button piercing this summer with our great range of jewelled belly button dangles. These dangly bananabells are cute, glamorous and perfect for showing off your piercing. Here at Body Jewellery Shop we have hundreds of cute belly button dangles, so I’ve picked out some of our favourites for summer 2012. When it comes to stylish glamour, you can’t beat polished silver and diamond jewels. Our selection of silver belly button dangles feature solid silver charms hanging from high quality surgical steel bars. They combine elegance with modern glamour, the perfect way to light up your look. This entry was posted in Belly (Navel) Piercings, Navel Bananabells and tagged Belly Bananabells, Belly Bar, Belly Bars, Belly Button Bars, Belly Button Dangles, Belly Dangles, Belly Jewellery, Belly Jewels, Belly Piercing Jewels, Cute Belly Bars on August 14, 2012 by Piercing Guru. Belly button bars come in a wide variety of styles and designs. Belly button bars are designed for belly button piercings, also known as navel piercings. Your belly button bar can be as fashionable or as subtle as you wish! A belly button bar isÂ designed with a standard size bar thickness of 1.6mm (14 gauge). Belly button bars come in different lengths, usually ranging from 6mm to 12mm, but some belly button bars can be found in longer lengths such as the belly button bars in our maternity belly bar range. 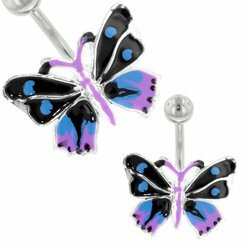 Pregnancy belly button bars are designed with a longer stem length to accomodate for a pregnant belly button piercing so you do not have to remove your belly button bar during pregnancy. 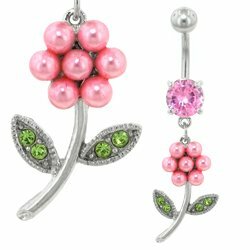 You will find a multitude of different types of belly button bars, with an infinite range of colours, styles, designs and themes. Choose your belly button barÂ fromÂ a range of different materials, including our extensive range of acrylic and plastic belly button bars, surgical steel belly bars, blackline belly bars, titanium belly button bars, UV belly bars, zircon gold belly button bars, natural gemstone belly bars, glow in the dark belly bars, gold belly button bars and PTFE belly bars. Don’t forget to check out our selection of belly button jewellery with a gorgeous selection of bright and funky belly bars, with belly button dangles, belly rings, belly button rings and even fake belly button barsÂ if you don’t have a belly piercing! This entry was posted in Acrylic Body Jewellery, Belly (Navel) Piercings, Blackline Body Jewellery, Gold Body Jewellery, Navel Bananabells, Stone Body Jewellery, Surgical Steel Body Jewellery, Titanium Body Jewellery, Zircon Gold Body Jewellery and tagged Belly (Navel) Piercings, Belly Bar, Belly Bars, Belly Button Bar, Belly Button Bars, Belly Dangles, Belly Jewellery, Belly Piercing Bar, Belly Rings, Belly Studs on December 8, 2009 by Piercing Guru.